A new study published in BioScience examines a bold new approach to halting the world’s extinction crisis through a strategy to protect 50 % of the Earth’s land mass. Researchers from the University Of Copenhagen are among the authors of the study. Many vertebrate species have vanished over the past 5 decades or have become critically endangered and the rate of extinction is accelerating. If habitat conversion continues unabated, key ecosystems could collapse, disrupting the biosphere upon which we all—humans and wildlife—depend. “Our paper shows that protecting half the Earth and saving the diversity of life is still feasible if we act now. The paper sets out an ambitious but achievable approach,” says lead author Dr. Eric Dinerstein. The groundbreaking study uses a new map of the world’s 846 ecoregions, improving on a 2001 version and analysis that remains one of the most widely cited papers in the field of conservation biology. Researchers from Department of Geosciences and Natural Resource Management at University of Copenhagen (UCPH) are among the authors of the study. “We have in particular contributed to the work with a more detailed natural vegetation map of East Africa prepared together with the World Agroforestry Centre in Nairobi. It is extremely important to have targets and indicators based on verified knowledge to be able to measure what happen with nature” says senior researcher Jens-Peter Barnekow Lillesø. Senior advisor Lars Graudal adds, “the state of the natural resource base is not only important for the purpose of conserving nature but also to design sustainable land management strategies for productive restoration of the more than 20% of the land surface that is degraded”. The new study highlights 98 ecoregions (12 %) that already have at least half of the land areas protected for the conservation of nature. 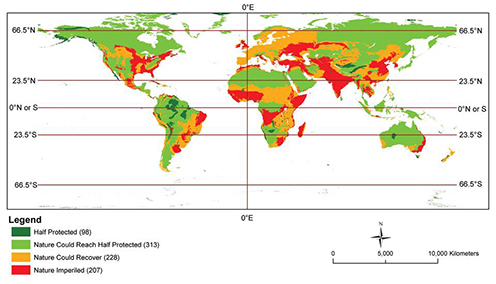 Another 313 ecoregions fall short of half-protected but have sufficient unaltered habitat remaining to protect the target. Why 50 % protected area? “In order to achieve comprehensive biodiversity conservation, many in the scientific community have empirically shown that an average target of 50% protected is required to sustain habitats and ecosystems. Currently, about 15% of the globe's land mass is somewhat protected; this number is not based on science and is insufficient," says co-author Dr. Reed Noss. The authors call on advocates and leaders to protect half the terrestrial realm by 2050.